And it aims at providing an answer to the frustrating (frustrating to me, at least) issue of Bayesian goodness-of-fit tests. There are however issues with the implementation, from deciding on which aspect of the data or of the model is to be examined, to the “use of the data twice” sin. Obviously, this is an exploratory tool with little decisional backup and it should be understood as a qualitative rather than quantitative assessment. As mentioned in my tutorial on Sunday (I wrote this post in Duke during O’Bayes 2013), it reminded me of Ratmann et al.’s ABCμ in that they both give reference distributions against which to calibrate the observed data. Most likely with a multidimensional representation. And the “use of the data twice” can be argued for or against, once a data-dependent loss function is built. The natural objection that having a multivariate measure of discrepancy runs into multiple testing is answered within the book with the reply that the idea is not to run formal tests. I still wonder how one should behave when faced with a vector of posterior predictive p-values (ppp). This entry was posted on February 4, 2014 at 12:13 am and is filed under Books, Statistics, Travel, University life with tags ABC, Bayesian data analysis, calibration, Duke University, exploratory data analysis, goodness of fit, model checking, O-Bayes 2013, p-values, posterior predictive. You can follow any responses to this entry through the RSS 2.0 feed. You can leave a response, or trackback from your own site. I am coming in months after the post, but I have a mundane thought: think about the simulation process as separate from evaluating the model. 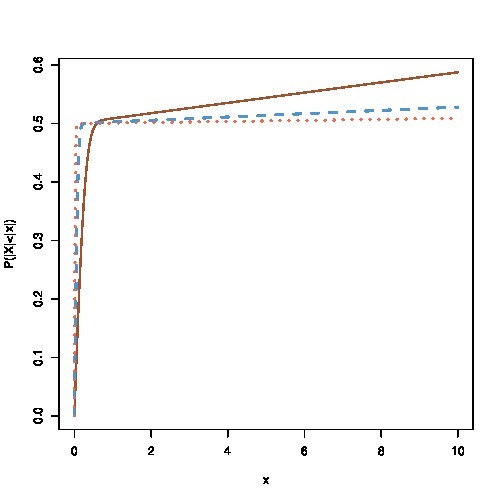 Simulating a dataset based on the posterior values is a step to elucidate a model: what are the observable consequences if the posterior distribution is true? If you’re very lucky, insights (or Enlightenment) will jump out at you from the simulation. But it may not, and measures based on the simulated dataset(s) can help with evaluating the model (after being elucidated by simulation). To the extent that you’re making judgments based on those add-on measures, you’re not really evaluating how well the model predicts new data, but you are evaluating a model based on the help you get in thinking through the “what if this is absolutely true?” consequences. It was my understanding that the cross-validated versions of these perform better in the sense that they are uniformly distributed and can, therefore, give some descriptive evidence of systemic bias (if the histogram is skewed left/right, u shaped or bell shaped). It depends what your goal is. If your goal is to estimate out-of-sample prediction error, then cross-validation is typically better (except for its higher computational cost); we discuss this in Chapter 7 of BDA3. If your goal is to examine discrepancies between fitted model and data, then I think it makes sense to use the full posterior distribution. See this recent paper for some discussion of this point. X: Thanks for the comments. I will need to digest your example. But, in the meantime, I’ve written a bit on the “using the data twice” issue; in particular, see here and here. S: You write, “I find that the posterior distributions are usually not representative of the data. What does this mean? If we take the idea of posterior predictive checks seriously, much published research will fall by the wayside.” No no no no no! We make this clear in the book (but not clear enough, I suppose): the point of the check is to understand where the model is not fitting the data, with an eye toward improving the model. There is no obligation or expectation that a model should be rejected, just because it does not fit! Rather, aspects of lack of fit are useful in helping us understand the limitations of our model. All our models are wrong. If you wanted to reject a model just because it was wrong, you could reject on theoretical grounds alone, before seeing any data at all. Posterior predictive checks are not about rejection, they’re about understanding the limitations of a fitted model. Hi Andrew, Thanks for the clarification. I guess I’m still kind of lost with the following point: once I know the limitations, now what? For example, in the Newcomb data one can create a better model as you suggest in the book. This reflects a key property of the data, the generation of a few extreme values. My point (which I didn’t make clear) is that this will probably change your inferencing (yes/no decision) process. E.g., if I use a cauchy distribution as the generating distribution, a “significant” effect is often no longer going to be “significant”. Maybe I am wrong about this in general; I’m still in the process of testing this out with real data. So, if I write up models in Stan that reflect the properties of the data more faithfully, my inferences are probably going to change. That’s what I meant that many results would fall by the wayside. I should add that it’s really great that people like Andrew and Christian are willing to engage with outsiders like me (who are end-users of statistics, so to speak). These conversations are impossible to have normally, and I have learnt a lot over the last three years as a result of following these discussions! Working with real data from psycholinguistics (reading data and the like), and carrying out pp checks of the type advocated in BDA, I find that the posterior distributions are usually not representative of the data. What does this mean? If we take the idea of posterior predictive checks seriously, much published research will fall by the wayside. I know Andrew that knows that, but it’s not clear how to proceed if the goal is a yes/no decision for theory evaluation (and whether Andrew likes it or not, that *is* the goal). I hope you are joking!! !